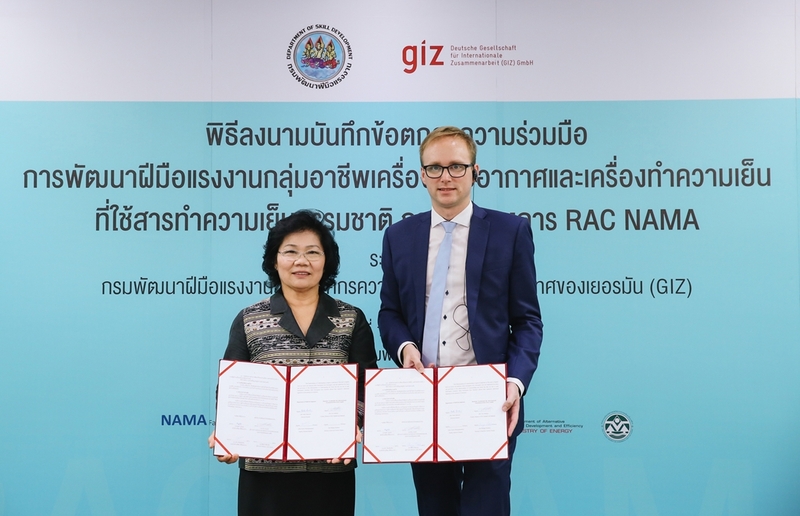 Bangkok, 15 November 2018 – The Department of Skill Development (DSD) of the Ministry of Labour and Deutsche Gesellschaft für Internationale Zusammenarbeit (GIZ) GmbH have signed a Memorandum of Understanding (MoU) to cooperate on skills development for technicians in the refrigeration and air conditioning (RAC) sector with a focus on natural refrigerants. The aim is to enhance their skills and capacities through training. “GIZ will support DSD in transferring knowledge on the proper handling of natural refrigerants. It will also help with training equipment and materials and provide technical experts from Germany as instructors for DSD trainers who will then be a connecting point to the Thai workforce. It is expected that the training will start in the first quarter of 2019. We have set a target of 48 trained trainers across the country and we expect to disseminate the knowledge to 2,000 technicians and other stakeholders within 2 years.” Mrs. Tawin added. The Thailand Refrigeration and Air-Conditioning Nationally Appropriate Mitigation Action (RAC NAMA) project supports Thailand in reaching its energy savings and greenhouse gas mitigation targets by promoting natural refrigerants for energy efficient and climate-friendly cooling technologies. The project strengthens the competitiveness of producers and commercial end-users in the refrigeration and air-conditioning (RAC) sector. It is funded by the NAMA Facility on behalf of the German Ministry for the Environment, Nature Conservation and Nuclear Safety and the UK’s Department for Business, Energy and Industrial Strategy.